But, what if I’m colour blind? How do I tell what Uber car is for me? Tons of Uber cars can be seen waiting outside big events such as concerts and festivals – or whatever else young people attend these days. In the past year, reports have shown that people don’t quite understand the difference between an Uber car and a civilian one. They have tried to alleviate this issue with stickers and more features inside the app, but still, people don’t understand in what car they should get into – no-no to civilians, go-go to your designated driver. The company has told every Uber driver to add the logo-sticker on their car’s windshield to reduce the amount of people jumping into the wrong vehicle. But still, nothing has changed. So, it has been decided – Uber adds SPOT lights so you don’t get into the wrong car. Regardless of the excuse. Inspired by TechCrunch writer John Constine’s idea – a few words away from being a full fledged demon hunter; Uber has brought forward SPOT. It’s basically a colored LED light that can be placed on the windshield. 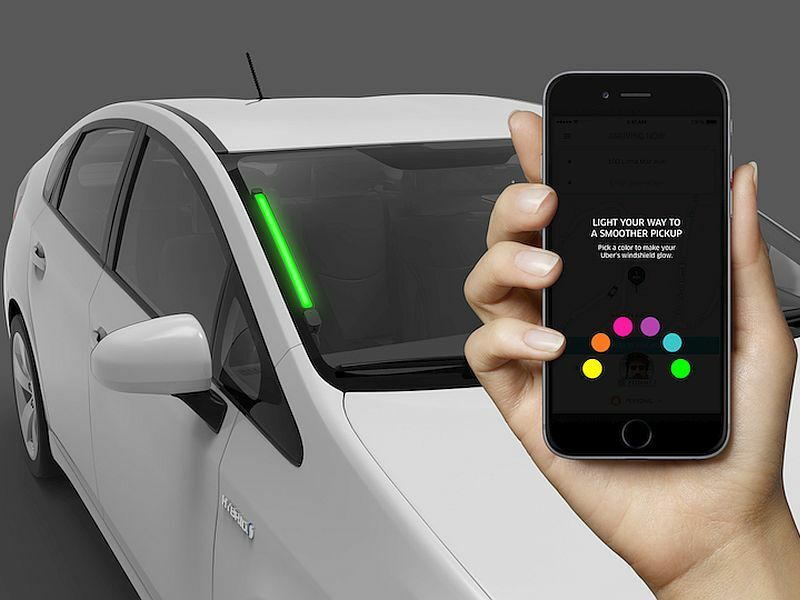 Passengers that are waiting to be picked up by an Uber driver, but don’t know what car to get into, can change the color of the LED light using the app. At the moment, there are 6 colours to choose from – green, blue, purple, pink, orange and yellow. So, let’s say the street is riddled with 4 Uber cars. Instead of drunkenly asking strangers if they’re the chosen ones to take you home, you can open the door and drunkenly fall asleep knowing that you’ll eventually get to your destination. SPOT even allows passengers to hold down a button to change their phone into one of the six colours so that the Uber driver can find them. Pretty neat, to be honest. Previously to this somewhat awesome new feature, passengers would either get inside a civilian car and quickly meet the embodiment of embarrassment or argue with other passengers that they were there first. Also, the app didn’t help at all – all the cars looked the same inside the app, the map was laggy more often than not, and don’t get me started on the license plates. SPOT is currently live in Seattle. If people find it useful and if it gets super popular, SPOT will most likely be rolled out to other markets in the U.S. and Europe. However, one big issue plagues this new strategy. Uber will have to provide this technology to every driver in the world. They have already failed on enforcing the windshield sticker rule, among other things – not many Uber drivers carry with them Android or iPhone charging cords. And little to none have got the required auxiliary cord for Uber’s Spotify Integration feature. It’s going to be tough to add SPOT lights so people don’t get into the wrong car anymore. And it’s also going to be expensive for Uber to do so. Here’s hoping that Uber’s new Spot Lights feature will mitigate the amount of people trying to catch a ride with me while I’m going home from work.